property. It is funny that I have never saw it mentioned in any document. When you purchase of track of land, it gives you rights that will extend to center of the Earth if you go down towards the ground and, in the opposite direction towards the sky, it would go to infinity… well, at least is what the theory says. 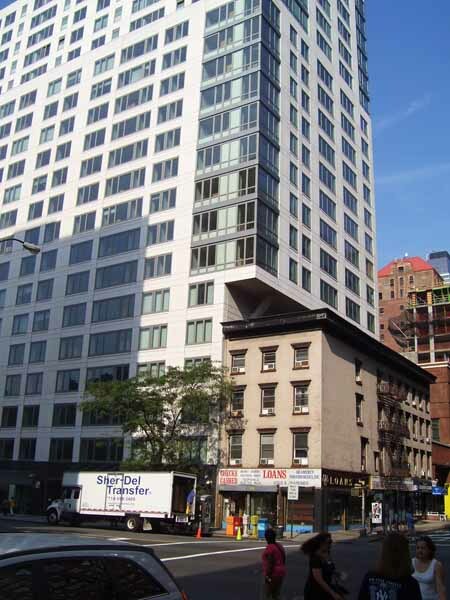 In the right place, the air rights alone can be worth $1,000,000s! In Atlanta, my hometown, we have a sprawling metropolitan area, where the majority of us still prefer to live in a “detached home,” build up is something more like “package deal” but no body talks about it. I have never heard of news that involving issues of these part of property rights around here. I do not have the necessary zoning info to make an informed opinion, so I could be mistaken, but, judging by this picture, I think that the owners of the 4-story building shot themselves on their feet: They gave up an extremely valuable commodity for Manhattan. Not knowing all the details, I will just say that sometimes the “foot print” dictates how high a building can go, but I do see a scenario where a developer would pay handsomely for the property and have the right to build a brand new construction with additional 15 to 20 floors up. I would build ultra modern one-floor condos in that space, perhaps even two floors plans to maximize my investment and attain top dollars for the investment. Oh, yes, and a penthouse. Please see how much light exposure that building offers. It also has a valuable three fronts. The process would revitalize the business on the first floor as well that certainly would bring more money for the rent. You’d better believe that lots of negotiations went on, and that the 4-story building owners received some compensation for it. And I do hope that they got a good chunk of money. In any case that is already done: That slice of the sky now belong to the tall beautiful white building. There is no going back on it! Mr. Donald Trump is perhaps the best-known person for being able to maneuver the “air rights” for the advantage of his projects. Mr. Trump is a polarizing figure but his knowledge of the air rights made him a legend and a billionaire in the process… More power to him! He has several books out detailing some of this thinking and dealings. All make for fascinating reading. And I would even add: If you are a young lawyer, investor, or entrepreneur in all walks of life, you owe to yourself to read some of his books.